Terrorists shelled Damascus with 20 mortar and rockets today, after the cessation of hostility agreement went effective. 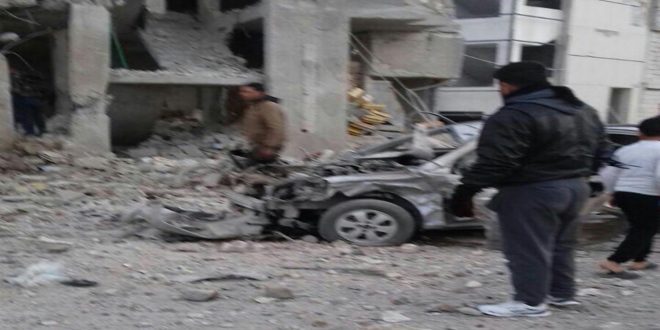 The shelling came from Joubar, and Duma in Damascus Countryside, and targeted residential areas. This was reported to the Russian coordination center in Khemim airbase, and in turn, the Russian side passed the information to the US Coordination center in Amman, Jordan. The Syrian Military command did not give retaliation orders to the Syrian artillery as a sign of patience, and issued a statement asking the Syrian nationals in these locations to and everywhere to take advantage of the national reconciliation efforts. Furthermore, the Syrian military asked the civilians in these locations to back up the Syrian commands national reconciliation efforts, knowing that they want to, and are being help human shields by the minority who are bearing arms against the Syrian government. The Syrian military’s self control and patience should not be taken as signs of weakness, we are showing the whole world that we are will to make the peaceful and political solution work; but the Syrian Armed Forces will not hesitate once when it comes to their duties in defending the Syrian people. A military source said Saturday that some armed terrorist groups fired a number of rocket shells at safe residential neighborhoods of Damascus. The source added, in a statement, that monitoring and following up operation proved that the source of these shells is Jobar neighborhood and Douma city in the Eastern Ghouta. The source pointed out that the General Command of the Army and Armed Forces warns against such acts, and at the same time, renews its call for all citizens to join local reconciliations and expresses its confidence that the majority of the citizens is eager to do that. The General Command also called on the locals of the Eastern Ghouta areas to use pressure against those few terrorists, who benefit from terrorism, to let them miss the opportunity of undermining the exerted efforts for restoring security and safety to these areas, the source added. One person was killed another was injured in terrorists’ attacks at al-Sheikh Maqssoud, and Suleiman Halabi neighborhoods in Aleppo city Saturday, a source at Aleppo Police Command told SANA. The source added that one person was killed and another was injured by terrorists’ sniper fires at the outskirts of al-Sheikh Maqssoud neighborhood. Terrorists, positioned in Bustan Basha neighborhood, also fired a rocket shell at citizens houses in Suleiman Halabi neighborhood injuring a woman who was hospitalized, the source added. Three children were killed and 12 other people were injured Saturday in ten ISIS terrorists’ mortar and rocket shells against al-Joura and al-Qosour neighborhoods in Deir Ezzor, a source at the governorate told SANA. 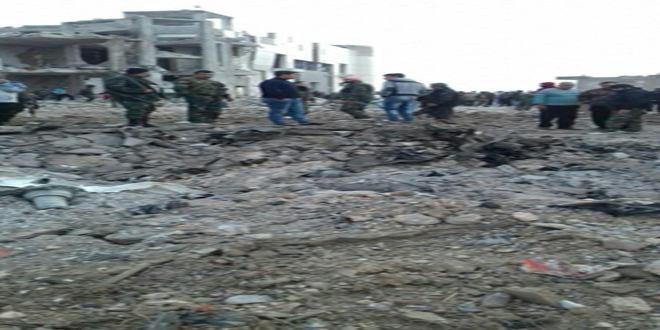 The attacks fired from al-Haweiqa neighborhood, also, caused material damage to citizens’ properties, the source added. Six civilians were killed on Saturday and several others were injured in three terrorist explosions in Salamyieh area in the eastern countryside of Hama. A Source at Hama Governorate told SANA that a suicide bomber blew himself up with a car bomb on Saturday at about 06:00 a.m., 1 km away from the eastern entrance of Salamyieh City in Hama countryside. The source added that two civilians were killed and 4 others sustained serious injuries. The terrorist attack also caused a material damage to the place and the hole at the site of the explosion proves that the car was a lorry and it was carrying about a ton of the explosive materials. Later, the source said that a suicide bomber blew himself up with a motorcycle bomb at the entrance of al-Tayba village in the eastern countryside of Salamyieh, killing 4 civilians and injuring others. The source added that a civilian was injured too in a terrorist bombing with an explosive device on the road of Salamyieh-Khneifes. ROJAVA, Syria (February 27, 2016) – After an effective military campaign in the town of Shadadi enabled the Syrian Democratic Forces (S.D.F.) to inflict significant blows to the Daesh (ISIS), elements of that terrorist group last night, February 26, launched a series of coordinated attacks in and around the city of Tal Abyad (Gire Spi). The massive assault – targeting south and east of Tal Abyad from two axis – was simultaneously carried out at 11 pm from Turkey and the occupied city of Raqqa. From Turkey side, numerous terrorist units stormed the city center of Tal Abyad and the villages Nastal, Khiwera, Qanatra located at zero point of the borderlines to the east of Tal Abyad region. Leading a charge from Raqqa, the terrorists at the same time targeted the line of Gantari-Shergirat villages in east of town Ain Issa, and southern Siluk. The People’s/Women’s Defense Units (YPG/YPJ) immediately responded to the attacks, and confronted the assailants in 15 different locations. Up to the time, those battles continue with all intensity. Detailed information on this fight and the results will soon be provided, but we insure our people and the public opinion these attacks will be defeated, and the terrorists will lose once again. As the Syrian ceasefire agreement came into effect, militants of the al-Nusra Front continue to threaten peace in the country. Despite the fact that the cessation of hostilities has just been declared, the reports of ceasefire violations across Syria have already started trickling in. The residents of Aleppo interviewed by RT said that while the ceasefire is in fact needed due to a precarious humanitarian situation in the region, it is unlikely to succeed. The main reason behind their skepticism is the fact that a significant number of opposition fighters deployed in the area belong to Jabhat al-Nusra, also known as the al-Nusra Front, which is a Syrian branch of al-Qaeda. The leader of Jabhat al-Nusra, Abu Mohammad al-Jolani, has already decried the ceasefire as a trick and called on his followers to continue fighting. It should be noted that both the al-Nusra Front and Daesh (ISIL/ISIS) are considered exempt from the ceasefire deal and thus can be freely engaged by all parties involved in the Syrian conflict. Bashar Ja’afari, head of the Syrian Permanent Mission to UN, has already said that Syrian forces have the right to retaliate against any violations of the ceasefire. Earlier it was reported that militant groups allied with the al-Nusra Front carried out attacks against residential districts and military personnel in Homs and Aleppo. The militants responsible for the attack in Aleppo belong to Liwa al-Sultan Murad group which is allied with al-Nusra Front and thus refused to abide by the ceasefire agreement. Terrorist groups stormed the city center of Tal Abyad and the villages Nastal, Khiwera, Qanatra located at zero point of the borderlines to the east of Tal Abyad in northern Syria, according to the Kurdish People’s Defense Units (YPG). 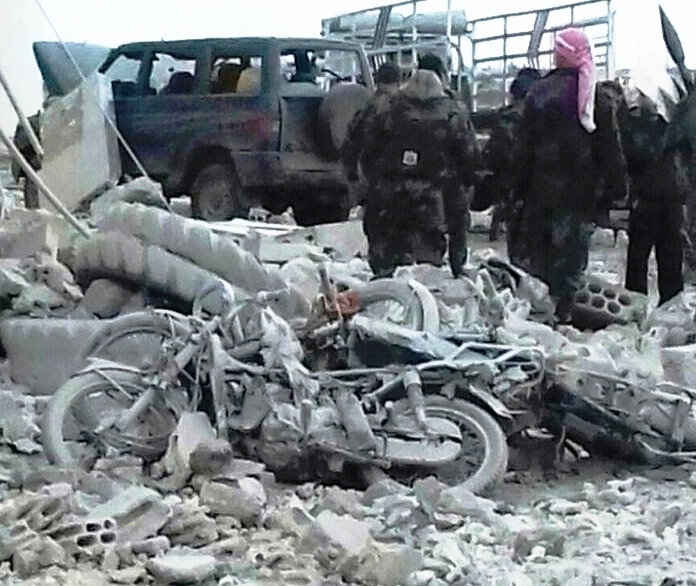 MOSCOW(Sputnik –Middle East) — The Islamic State (ISIL or Daesh) militants have launched a series of attacks on Tal Abyad in northern Syria near the border with Turkey, the Kurdish People’s Defense Units (YPG) said in a press release on Saturday. “After an effective military campaign in the town of Shadadi enabled the Syrian Democratic Forces (S.D.F.) to inflict significant blows to the Daesh (ISIS), elements of that terrorist group last night, February 26, launched a series of coordinated attacks on the city of Tal Abyad,” the press release read. According to the press release, the assault, which targeted south and east of Tal Abyad, was launched simultaneously from the Turkish side and the occupied city of Raqqa. “From Turkey side, terrorist groups stormed the city center of Tal Abyad and the villages Nastal, Khiwera, Qanatra located at zero point of the borderlines to the east of Tal Abyad. Leading a charge from Raqqa, the terrorists at the same time targeted the chain of Gantari-Shergirat villages to the east of town Ain Issa, and southern Siluk,” the press release read. According to the press release, detailed information on the ongoing fight against terrorists and its results are due to be provided soon. A spokesman for the Syrian Democratic Forces said that Kurdish militias drive Daesh militant group from the Syrian town of Tell Abiad located near the Syrian-Turkish border and killed 70 militants during the operation. CAIRO (Sputnik –Middle East) —Kurdish militias drive the Islamic State (Daesh) militant group from the Syrian town of Tell Abiad located near the Syrian-Turkish border and killed 70 militants during the operation, a spokesman for the Syrian Democratic Forces said Sunday. “All the attacks have been repulsed, and all the places where the terrorists have succeeded to gain a footing are mopped up,” Talal Salou (Salu) told RIA Novosti. 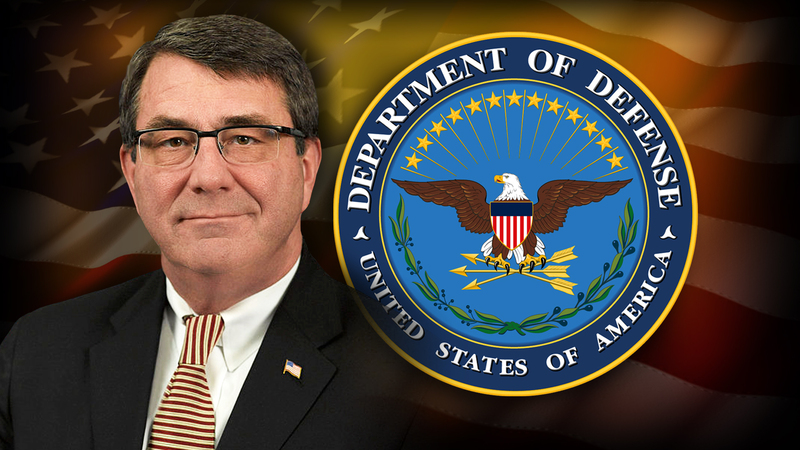 He added that Daesh, which is prohibited in many countries, including Russia and the United States, had lost some 70 militants during the operation. A unit of the army and the armed forces on Saturday foiled a ISIS terrorist attack in the countryside of Salamyieh City in the eastern countryside of Hama Province. A military source told SANA that a unit of the army destroyed a car bomb loaded with huge amounts of explosives that belongs to ISIS terrorists before reaching one of the military points in the surroundings of al-Mffaker village in the countryside of Salamyieh City. Later, a military source said army units thwarted attempts by ISIS to attack military positions in al-Salamiya countryside in Hama province along the direction of Barri Sharqi/Aqareb/al-Bassel forest/Tal Abyad, inflicting heavy losses in personnel and equipment upon the terrorists. The source said the clashes resulted in the death of 35 terrorists, injured scores of them, and destroyed 4 machinegun-equipped vehicles, a bulldozer, artillery pieces, and mortar launchers. Earlier today, Six civilians were killed and several others were injured in three terrorist explosions in Salamyieh area in the eastern countryside of Hama. Earlier Friday, army units, in cooperation with the popular defense groups, restored security and stability to Rasm al-Teineh and Mentar al-Hajaneh villages in the eastern countryside of Hama, inflicting terrorists’ heavy losses in personnel and equipment. In Deir Ezzor province, the Syrian Air Force eliminated a number of ISIS leaders in a series of concentrated airstrikes on their positions in the province’s countryside. A military source told SANA that the airstrikes focused on ISIS hideouts, bases, and concentrations in al-Sfaira al-Foqani village 12 km northwest of Deir Ezzor city, which resulted in the death of a number of ISIS leaders and in destroying entire hideouts along with the weapons and ammo inside them. The source added that airstrikes also destroyed ISIS hideouts and concentrations in al-Jafra village in the countryside east of Deir Ezzor city. TEHRAN (FNA)- Battlefield sources in the Northeastern province of Raqqa announced that the Kurdish People’s Protection Units (YPG) alongside the Syrian Democratic Forces (SDF) have engaged in heavy fighting with the ISIL terrorists in the Northern part of the province. The Kurdish forces stormed the ISIL positions near the town of Tal Abyadh and inflicted major losses on the terrorists. Also on Friday, the YPG and SDF stormed the ISIL gathering centers near the villages of Marwaha in the Southeastern part of the town of Sarin, killed or wounded several terrorists and destroyed their military equipment and vehicles. On Wednesday, the Kurdish fighters, after almost six day of intense battle against al-Nusra Front, the Free Syrian Army (FSA), Harakat Nouriddeen al-Zinki and Al-Shamiyah Front, imposed full control over the Bani Zeid Youth Housing Complex in Aleppo city. Assisted by the Syrian army – that has along with popular forces and Hezbollah conquered almost all militant-held regions in Eastern, Southern, Western and Northwestern Aleppo province – and Russian air support, the Kurdish forces fighting against the terrorists in North-Northeast Aleppo province have been making striking advances against the al-Nusra, Ahrar al-Sham and ISIL terrorists in February. Earlier this month, the YPG and SDF fighters prevailed over the terrorists in the highly strategic city of Tal Rifat in Northern Aleppo and captured the city. The YPG, who enjoyed the Russian air backup, prevailed the terrorists’ positions from the Western direction and shook hand with the Kurdish units of the SDF who entered the town from the North. TEHRAN (FNA)- The ISIL terrorists sustained heavy casualties in clashes with the Kurdish forces in Raqqa province on Saturday. At least 45 ISIL terrorists were killed in tough battle with the Kurdish People’s Protection Units (YPG) and the Syrian Democratic Forces (SDF) in the town of Tal Abyadh in Raqqa province today. In a relevant development earlier today, battlefield sources announced that the Kurdish forces had engaged in heavy fighting with the ISIL terrorists in Northern Raqqa. The Kurdish forces stormed the ISIL positions near Tal Abyadh town and inflicted major losses on the terrorists. TEHRAN (FNA)- The Syrian Army and its popular allies continued to push the ISIL terrorists back from their positions Southeast of Aleppo province and imposed full control over one more key village and strategic hills in the region. The Syrian army and the National Defense Forces, in a several hour battle, forced the ISIL to retreat from the surrounding of the village of Sallaleh al-Saghireh and Telal (Hills) al-Za’arour. The ISIL left behind tens of dead or wounded members and fled the battlefield to evade more casualties. The engineering units of the army, for their part, defused scores of bombs planted by the ISIL in the villages’ buildings. In relevant developments on Friday, the Syrian government forces pushed the ISIL back from their strongholds near the villages of Man’aya, Joukheh and Sallaleh al-Kabireh in the Western side Rasma al-Nafal following hours of intense battle which ended in the killing and wounding of dozens of the terrorists. TEHRAN (FNA)- The Syrian army continued its advances in Lattakia against the Jeish al-Fatah (the Army of Conquest) terrorist group and seized back more key regions in the coastal province on Saturday. The army units pushed back the Jeish al-Fatah militants from the surrounding areas of al-Saraf village after four-hour battle. Fierce clashes are presently underway near the village of al-Navareh. The army has sent several reinforcement forces to prevent the militants from making advances in the area. On Friday, the Syrian army commandos stepped on the territories of the Northwestern province of Idlib after prevailing over the last defense lines of the militant groups and capturing of Ein al-Beidha in Lattakia province. The Syrian commandos finally reached the strategic border with the Idlib province after several-month-long of nonstop fighting with the terrorists of al-Nusra Front and the Free Syrian Army (FSA) in the Lattakia province’s Northeastern part. Also yesterday, the Syrian army and National Defense Forces drove the militant groups back from more villages in the mountainous regions of Lattakia near the border with Turkey. The pro-government forces, after several hours of tough battle, imposed full control over the villages of Ein al-Beidha, Shir al-Dhaba’a and Ruweisat Rasho. Scores of the militants were killed or wounded in the army attacks. The engineering units of the army have started to defuse bombs and other kinds of explosive devices planted with the militants in the newly-liberated villages’ buildings. TEHRAN (FNA)- The Syrian Army is on the march in Western Ghouta, Damascus countryside, and seized back more lands after hours of heavy fighting against the militants. The Syrian army pushed the militant groups back from their positions in the Eastern side of the city of Darayya and retook full control over at least 20 more residential building blocks near Kaziyeh Shmit on the axis of al-Ghariyeh al-Saghireh. The militant groups left behind several dead or wounded member and fled the battlefield to find safer positions. Earlier reports said that two notorious commanders of Ajnad al-Sham and Liwa Shohada al-Islam terrorist groups were killed in clashes with the Syrian Army troops and popular forces in Western Ghouta, Southwest of Damascus province. Feisal al-Shami also known as Abu Malik al-Miqdad, a leader of Ajnad al-Sham, was killed in a heavy fighting with the Syrian government forces in Darayya. Meantime, the militant group in its social media pages confirmed the death of Imad Abu Mohammad, a field commander of the so-called Liwa Shohada al-Islam terrorist group, alongside a number of his comrades in another clash with the Syrian army. TEHRAN (FNA)- The Syrian soldiers attacked the militant groups’ positions in the Southern districts of Dara’a city and pinned the terrorists down behind their lines of defense under heavy fire. The Syrian army men stormed the militant groups’ strongholds in the neighborhood of Dara’a al-Balad in the Southern part of Dara’a city, killed or injured 20 of the militants and destroyed their machinegun-equipped vehicles. Reports said also on Friday that the Syrian army troops and the popular forces continued to target the al-Qaeda-affiliated Nusra Front’s concentration centers East and Northwest of Dara’a province. The Syrian army and the National Defense Forces stormed the ISIL strongholds in Um Walad region, in which several machinegun-equipped vehicles of the militants were set ablaze. In the meantime, the army soldiers opened fire at one of the supplying lines of Nusra fighters in the Northeastern part of Yadouda, which ended in destruction of several military vehicles and the cutting of the supplying line. TEHRAN (FNA)- The Syrian army troops alongside Customs officials in the Central province of Homs seized a vehicle loaded with a large volume of ammunition heading to militant-held regions in the neighboring province of Hama. The cargo of militants’ weapons and ammunition, including machineguns’ bullets and grenades, was seized by the Syrian authorities on a road to the town of Masyaf in the Southwestern part of Hama province. On Friday, the Syrian Army and National Defense Forces stormed the ISIL militants’ lines of defense in the Eastern part of Hama province and forced them to retreat from their positions near at least two more villages in the region. The Syrian pro-government forces continued to advance against the militant group and imposed full control over the villages of Rasm al-Teineh and Mentar al-Hajaneh following hours of intense battle. The ISIL suffered a heavy death toll and its military hardware sustained major damage in the attacks. TEHRAN (FNA)- A column of ISIL’s military vehicles, mainly armored ones, sustained major damage after the Syrian army opened heavy fire at the convoy in the Eastern province of Deir Ezzur. The Syrian army targeted the ISIL column of armored vehicles, including several tanks, deployed in the Southern part of Euphrates River near the village of al-Mura’yeh in the Eastern part of the province. The Syrian army’s attacks inflicted major damage on the ISIL vehicles. A reports said on Friday that the Syrian Army troops’ offensives across the Eastern province of Deir Ezzur ended in the killing of tens of ISIL terrorists, including Libyan and Iraqi nationals. Wali al-Shaddadi, also called by the ISIL Abu Osama al-Iraqi and Abu Sayyaf al-Libi (the Libyan) were killed in the Syrian army attacks in Deir Ezzur. In the meantime, the ISIL site near the town of Ayash was hit by the Syrian army, which ended in the destruction of the terrorists rocket-launching pads. The army also engaged in fierce clashes with the ISIL terrorists in the surroundings of Deir Ezzur air port and the village of Beit Doqiem, which also inflicted major losses on the militants. One person was killed another was injured in terrorists’ attacks at al-Sheikh Maqssoud, and Suleiman Halabi neighborhoods in Aleppo city Saturday. A source at Aleppo Police Command added that one person was killed and another was injured by terrorists’ sniper fires at the outskirts of al-Sheikh Maqssoud neighborhood. 3 children were killed and 12 other people were injured Saturday in ten ISIS terrorists’ mortar and rocket shells against al-Joura and al-Qosour neighborhoods in Deir Ezzor. A Source at Hama Governorate said that a suicide bomber blew himself up with a car bomb on Saturday at about 06:00 a.m., 1 km away from the eastern entrance of Salamyieh City in Hama countryside. The terrorist attack also caused a material damage to the place and the hole at the site of the explosion proves that the car was a lorry and it was carrying about a ton of explosive materials. As of this Saturday February 27th a peace proposal brokered by Russia and the United States is scheduled to take effect in Syria for one week. 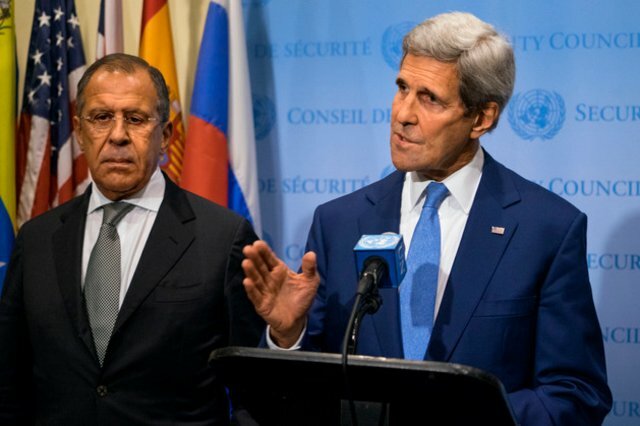 But if last Monday both the US and Russian presidents expressed hopeful optimism that the war in Syria might be coming to an end this Saturday, then why on Tuesday would Saudi Arabia, United Arab Emirates and Bahrain issue warnings to all its citizens in Lebanon to immediately evacuate as well as impose a travel ban to Lebanon. Beirut, Lebanon is located only 54 miles from Syria’s capital Damascus. Hence, an invasion force through Lebanon seems a most plausible avenue given this scant piece of turf separating invading forces from their eyed prize – an overthrow of Assad. The Turkish leader in so many words is telling the world that the ceasefire only applies to Syria, not other nations like Turkey, Saudi Arabia or for that matter their 34-nation Sunni Arab coalition supplying 350,000 soldiers currently prepping in northern Saudi Arabia for the already declared Syrian invasion. The Machiavellian strategy of pure deception and attempted stealth deployed by a litany of US Empire lies and false flags would cunningly sign a truce just as its Arab allies pre-position themselves to move forward with a massive invasion by the Saudi-led Arab Antiterrorism Coalition (a misnomer if there ever was one) to invade Syria from all directions. This presentation examines the realistic and probable underlying plans still in place yet transparently masked by America’s so called truce starting Saturday that the US will likely still permit its proxy nation allies Turkey and Saudi Arabia to spearhead their invasion of Syria already announced two week ago. It’s the old “good cop-bad cop” strategy. While Empire signs agreements for peace, its bloodthirsty allies are lustfully preparing for war. A Middle Eastern map at a glance illustrates the short distance across a narrow strip of Jordan less than 60 miles wide separating northern Saudi Arabia from Syria’s southeastern border. From Saudi Arabia passing through Jordan – a known training ground for terrorists, would be a potentially viable route and entry point into Syria for launching a major ground war invasion. A Saudi military spokesman general reiterated two weeks ago that his nation’s decision to invade Syria is both “irreversible” and “final,” and he’s backing it up with 350,000 troops from his Saudi-led 34-Sunni nation coalition currently participating in war games near the northern Saudi city of Hafar Al-Batin close to the Iraq border. As a longer route an enormous ground force invasion could also cut through Iraq’s southwestern corner into Syria. Because of the distance involved, it would be the first ground troop movement towards Syria to detect as a key part of a possible larger, multi-pronged attack on Syria from all sides. On Thursday Kerry mentioned anywhere from 15 to 30,000 troops necessary to create and secure a “safe zone” in northern Syria. More thinking aloud here – might those Turkish troops at the border plunging southward be conveniently used to establish John Kerry’s said Plan B? The elephant in his room is that safe zone would be for the terrorists, not the so called displaced Syrian civilian population the feds like to talk about. The old humanitarian excuse for military intervention is standard lying policy. Meanwhile to try and soften up that northern border for an invasion, Turkey’s daily shelling is intended to push back the Syrian coalition forces that have recently made significant strides toward sealing off the border to Turkey. This would obviously be the quickest invasion route into Syria in last gasp effort to reverse militants’ recently lost territory in Latakia and Aleppo and a chance to reinforce and salvage the remaining terrorist stronghold in Raqqa. But superior Russian forces with airpower superiority, air defense superiority and very competent, battle-tested allies would defeat a Turkish incursion in Syria and the top generals in Ankara know this. But unfortunately their tyrannical leader is an unpredictable megalomaniac. Though a cessation of violence and peace ending the five year bloody rampage of a war brought on by US Empire of Chaos and Destruction would come as a welcomed long-awaited Godsend to the long suffering people of Syria, it would be considered a disaster to the sinister anti-Assad forces bent on further treachery and bloodshed. In all likelihood they are only planning to misuse the truce as a deceitful attempt to gain an elemental trace of tactical surprise in launching their military offensive into Syria. Though a common enough pattern in history as numerous nations have used this deceptive Machiavellian “art of war” strategy to their advantage, it’s a tall order to preannounce your invasion and then actually surprise anyone. But signs still eerily portend that the pro-terrorist coalition of Sunnis, their Sunni terrorists fighting inside Syria and the West’s pro-terrorist US-NATO-EU-Israel alliance range from minimally complicit to actively plotting a massive, multi-pronged, protracted, costly campaign that couldrisk WWIII ending all earthly life. So it all comes down to the US led pro-terrorists versus the Russian led antiterrorists. Should an invasion occur attacking the antiterrorist forces aligned on history’s moral high ground operating in good faith to cease military operations except against ISIS/al Qaeda/as-Nusra Front and any would-be invading terrorist nations, the winners will not be the pro-terrorists. The Saudis are already bogged down in a stalemate and losing busily cause committing crimes against humanity against the poorest Middle Eastern nation in Yemen. And the Turkish military is inexperienced at war compared to its seasoned opponents. Truces have also been misused to deceptively launch surprise attacks, although Turkey and Saudi Arabia broadcasting their plan a couple weeks ago for a massive joint troop invasion into Syria would hardly come as a surprise now. Plus, deployment of Saudi military units and warplanes to Turkey and the largest military exercise in Middle East history (in early March the US and South Korea are engaging in their biggest ever joint military exerciseinvolving 105,000 troops incurring North Korea’s wrath) presently taking place in northern Saudi Arabia could easily be construed as invasion precursors. The precedent for military drills to suddenly go live in response to a deep state covertly planned and timed crisis has become a tall-tale sign of virtually every false flag terrorist operation. Additionally, during this entire month of February from its side of the border Turkey has been brutally shelling northern Syria with heavy artillery mortar fire killing Syrian Arab Army soldiers, Syrian Kurd forces, at least one confirmed Russian advisor and Syrian civilians, flagrantly defying both the US and UN Security Council demands. Turkey has also been violating international law by sending Turkish soldiers and more terrorists inside Syria asreinforcements. Turkish madman President Erdogan is taking US backing the Syrian Kurds personal. A cessation of violence so that all the prime investors in terrorism on this planet currently amassed at the border with guns blazing are not about to passively sit by watching their billions worth of vested interest in an Islamic Wahhabi Caliphate or second Ottoman Empire be systematically destroyed. That simply will not happen and Russia, Syria and Iran must fully realize as well even if they are upholding the truce. No doubt Putin who’s outplayed, out-maneuvered and outclassed Obama, his neocons and Western vassals at every turn also sees through the US phony con job of a truce that has no chance at all to bring lasting peace, not when Armageddon’s knocking at the door. All this escalating, mounting aggression recently by Turkey, Saudi Arabia and their Gulf State allies are overt provocative acts in preparation for triggering a much larger scaled war. This Turkish-Saudi led Arab coalition consisting of the Islamic State’s strongest, most fervent terrorist supporters have stated it will invade Syria as soon as the United States gives them the go-ahead. Of course this comes after recent weeks of the Russian-Syrian coalition’s dramatic success decisively cutting off the terrorist supply line from Turkey and soundly defeating the jihadist militants now running for their lives. Thus, in desperation the most pro-terrorist nations on earth representing by proxythe US-NATO-EU-Israel axis-of-evil are using the fork-tongued lie that they will invade Syria to fight against the terrorists when of course we all know they will be fighting against the only true anti-terrorist forces the Syrian-Russian coalition. It’s the pro-terrorists last ditch desperado effort to protect and save what’s left of their barbarian terrorists. If you really believe that this truce will successfully halt all further aggressive actions by Turkey and Saudi Arabia et al after mobilizing such a massive military force into pre-invasion positioning at multimillion dollar expense when both the Saudi and Turkish economies have never been shakier, one would have to be blind to believe that on Saturdayonce the truce is in place they will all just simply pack up their arms and go home. It’s all too obvious that the war in Syria will turn in an instant from a regional conflict to a world war if US Empire gives the greenlight for the Arab invasion that’s really just another divide and conquer war pitting Sunni nations against Shiite nations Syria, Iraq and Iran. But even more significant, it will also initiate a West versus East showdown against Russia, China and North Korea, and of course this holds broader nuclear implications that could potentially end all life on this planet. The ruling elite has engineered through its servant lackey leaders of the West and their puppet governments Turkey and Saudi Arabia the perfect storm of events all converging, colliding and exploding in the days and weeks ahead. With Europe overrun and reeling from the globalist manufactured mass migration crisis, the EU is about to go bust. With virtually every honest economist and financial analyst unanimously predicting that the global economy is on theverge of total collapse starting with the Deutsch Bank, like dominoes all the major banks will fail once again while national economies crash. Covert legislation in both Europe and North America will ensure that this time around instead of a “too big to fail” buyout, a buy-in will steal citizens’ life savings from their private bank accounts. All the central banks, Homeland Security, FEMA and the rest of the treasonous Washington criminals have been methodically preparing for this moment in history for decades. So as a weapon of mass distraction, the elite has manipulated the global chessboard for World War III. In the days leading up to Saturday’s truce we have been witnessing the predictable banter and squabbling. Regional kingpin bully and nuclear-powered antagonist Israel that borders war torn Syria from the south has war criminal Netanyahu phoning Putin on Wednesday soliciting assurances that Israel’s designated enemies – Syrian, Iranian and Hezbollah forces – as Russian allies will not attempt to take advantage of the truce by advancing into the disputed Israeli occupied oil rich Golan Heights that Israel stole from Syria during the 1967 Six-Day War. It’s total hypocrisy for Netanyahu to even act like he’s so worried defensively when he along with US Empire has always been the longtime aggressor and secret supporter of jihadist terrorism. He knows that a world war about to erupt at his backdoor is all part of his Zionist Plan. Washington policy – the policy of the USA military-industrial complex and their Wall Street bankers – has in no way changed… They plan to destroy Syria as a functioning nation, to finish the destruction of Iraq begun in 1991, and to spread that destruction now to the Kingdom of Saudi Arabia, to Turkey, and across the entire oil and gas-rich Middle East. Filed under: Al Qaeda, AngloZionist Empire, Arab Zionists, Assad, ISIL, Islamophobia, Jordan, Lavrov, Moderate Terrorist, Nusra Front, Russia, SAA, Saudia, Truce, Turkey, USA, War on Syria, Wars for Israel | Tagged: Kerry, PKK |	Comments Off on Is the Truce in Syria A Deceitful Neocon Strategy to Launch a Pro-Terrorist Arab Coalition Invasion? لأول مرة أرى أن الحيرة حائرة .. وأرى المحللين على طرفي الحرب في سورية ينظرون الى هذا المخلوق الذي دخل عليهم فجأة واسمه “وقف الأعمال القتالية” كمن داهمهم زائر غامض تحت جنح الظلام بلا ملامح ولاهوية .. وهم لايعرفون ان كان ذكرا أم أنثى .. وأراهم يمدون أيديهم يتلمسونه ويبحثون عن علائم ذكورته أو علائم أنوثته .. بعضهم تحسس مخالبه وبعضهم رأى فيه دليلة التي خدعت شمشون لتتمكن من قص شعره الذي يمنحه القوة ..
وكعادتي عند كل مفصل من مفاصل الحرب على سورية لاأعبأ بما يكتبه الثوار لأنني اعتدت بعد أن أقرأه أن أرميه في سلة المهملات لأنه يندرج في اطار الأمنيات وخداع النفس قبل الخصم .. وكما توقعت فان بعضهم سارع على الفور للربط بين تصريحات المندوب الروسي في الأمم المتحدة فيتالي تشوركين – التي وصفت بأنها رسالة حادة للسوريين – وبين الاتفاق الروسي الاميريكي لوقف العمليات القتالية .. وعلى الفور جهز هذا البعض وليمة من السراب والأحلام الجميلة ودعا اليها الحالمين من المعارضين الذين اعتادوا أكل السراب والجراد والأحلام ثلاث مرات يوميا حتى تحولوا الى سراب من أشباه البشر تتبعهم أسراب من الجراد .. فعلى الفور استحال بوتين – وفق تحليلاتهم – الى رجل تخلى عن الأسد وصفعه .. ووصل الأمر بأحدهم أن درجة الحلم فاقت التصور وخرج بالبشارة بأن دور الأسد قد انتهى أخيرا من بعد طول انتظار واننا دخلنا في عهد مابعد الأسد وسقوط الرايخ !! وهكذا سقط الرايخ السوري في يوم وليلة .. وهذا يدل على أن هذا النوع من جهابذة المعارضة يشبهون من فقد قطعة نقود في شارع مظلم فخرج يبحث عنها في شارع مضيء لأن البحث هناك أسهل .. ويدل على أن من يكتب عن سقوط التاريخ السوري فانه يعتقد أن الكتابة هي فن من فنون طهي “المحاشي” .. أي املأ السطور بالكلام المحشو اللذيذ بالجوز والفستق والرز والمقارنات والاسقاطات المستحيلة وقدمه مع المخلل للقراء .. وبالصحة والهناء على قلوب المعارضين ..
حتى الآن رغم الحذر أو الترحيب لايعرف أحد كيف سيكون تنفيذ الاتفاق ولايعرف من الخاسر ومن الكاسب؟؟ وبسؤال من نوع مباشر يسأل البعض: من الذي خدع الآخر.. الروس أم الأميريكان؟؟ لأن هذا الاتفاق ينطوي حتما على خديعة أو ثغرة أو حصان طروادة .. وكل يبحث عن حصانه الخشبي وعن الثغرات ..
الوطنيون السوريون يتوجسون من أن يكون الاتفاق كابوسا لأنه سيعني أن عملية التحرير التي انطلقت بنجاح كبير سترغم على التوقف .. مما ينقذ المجموعات المسلحة من مصير محتوم ويعطيها الفرصة لكي تعيد تنظيم صفوفها وخطوطها الدفاعية ونوعية سلاحها والتواصل اللوجستي الذي تقطّع .. والحقيقة أن المعارضين كما بات واضحا مستميتون من أجل تحقيق الهدنة “الشاملة” ويرون فيها الخلاص بدليل أنهم يريدون أن يشمل هذا النعيم كل المجموعات والفصائل دون استثناء لأن حجم الضربات التي تعرض لها الجسم المسلح كان شديدا ومؤثرا للغاية .. ويدل الاصرار على الهدنة وشمولها جميع الفصائل أن الموقف العسكري للمعارضة صعب للغاية وأن معنوياتها في الحضيض وأنها تتوقع الأسوأ وتعرف يقينا أن صمودها في هذا المناخ العاصف بالسلاح الروسي وأعاصير السوخوي صار مهمة مستحيلة .. حبث تم تحييد التاو .. ويوفر التفوق الجوي الكاسح الذي يترافق مع تحرك بري مدروس وغزارة النيران كل الأسباب للانكسار العسكري للمعارضة الارهابية ..والحقيقة أنني لم أجد منذ بداية الحرب على سورية هذا التوق والاستماتة من قبل المعارضة على تحقيق هدنة تشمل الجميع .. ولايفسر ذلك الا بأن العملية العسكرية اقتربت من قصم ظهر المعارضة شمالا .. والمعارضون يرون أن التقاط الأنفاس سيكون فرصة لتضميد الجراح ونقل الدم والاسعافات وتدارك الثغرات .. خاصة أن المعارضة التي انتظرت سلمان وأردوغان وجدت أن الرجلين يتثاقلان ولاينفران رغم كل الدعوات الحثيثة والآمال العريضة في التحرك .. وهما يرميان بالمبررات تلو المبررات لتجنب التورط بالحرب ..
اذا عرفنا من الخاسر من أي اتفاق سنعرف من الذي خدع الآخر .. فهل تعيدنا الهدنة الى مرحلة خدعة مراقبي الجامعة العربية الذين أدخلوا في بداية الاحداث الى المدن السورية بحجة التحقق من ادعاءات النظام والمعارضة؟؟ ولكن وجود المراقبين في المدن في تلك المرحلة كانت لابعاد الأمن والجيش عن قلب الأحياء المتمردة للسماح لها للاستعداد لبناء الاستحكامات والتحصينات لاعلان التمرد العسكري المسلح بالعنف الأقصى كما حدث في داريا ودوما وحمص .. ورغم أن القيادة السورية كانت تدرك تلك الخدعة لكن في تلك المرحلة الصعبة كان من الصعب رفض التحدي كيلا يفهم جزء من الجمهور السوري الذي كان حائرا أن الدولة لديها أسرار لممارساتها تخشى كشفها .. وكانت المناورة الأفضل هي كسب الناس قبل أن تكسبهم الدعاية الشرسة ..
لكن التمعن في الاتفاق الحالي الذي يبدو ظاهره طوق نجاة للمسلحين الموالين لتركيا والسعودية ربما يكشف أنه طوق النجاة المفخخ لهم أيضا .. فالزمن ليس كذلك الزمن الذي كان من الممكن تمرير الخدع والحيل .. لأن الاتفاق سيعني أن المعارضة ليست كلها محمية بوقف الأعمال القتالية وأن الجيش سيتمكن الآن من تحييد مجموعة كبيرة من الفصائل المسلحة وهو يفتك بأشرس المسلحين الباقين .. فهذا الاتفاق ينسجم مع مبدأ تفكيك الجبهات وقضمها .. فنحن نواجه داعش والنصرة ومكونات أخرى مسلحة منها جيش الاسلام ونظائره .. وهؤلاء جميعا ينسقون معا في توقيت هجماتهم فعندما ينشغل الجيش مع داعش تطعنه النصرة شمالا وعندما يواجه النصرة تستغل داعش أن النصرة تشاغل الجيش فتضرب .. وفي عز معارك تدمر وادلب كان جيش الاسلام يحاول احداث اختراقات مهمة في العاصمة ..
ان استثناء جبهة النصرة في الاتفاق وبقاء مصطلح (مجموعات أخرى ارهابية) سيخلق الشرخ المطلوب الذي قد يتدفق منه الحل السياسي الذي تصنعه روسيا وسورية وايران .. لأن جبهة النصرة والمجموعات الأخرى ستواجه المعركة في ادلب وحلب وحيدة .. دون مساندة من أي فصيل مصنف أنه معتدل اذا تضمنه اتفاق الهدنة .. واذا قصم ظهر النصرة في الشمال فان جيش الفتح كله سيعاني من أنه جسم بلا عظام لأن النصرة هي العظم القاسي لجيش الفتح .. ودونها فان جيش الفتح سيكون رخوا .. ومن هنا فان هناك استماتة للدفاع عن جبهة النصرة من قبل جميع المعارضين التابعين لتركيا والسعودية .. وكأن مقتل المعارضة يكمن في مقتل جبهة النصرة .. ولذلك فان التفاعل في جبهة الشمال سيكون شديدا لأن الشقاق سيتفاعل بين النصرة وشقيقاتها .. فالنصرة ستكون أمام امتحان الولاء من قبل بقية الفصائل التي ستقبل بالنأي بالنفس عنها .. أو سترفض التزام الهدنة من دون النصرة .. وهذا سيعني أن هذه الفصائل ستعامل معاملة داعش والنصرة وهي التي ستملأ الفراغ الغامض المنضوي تحت عبارة (مجموعات ارهابية أخرى) .. وهناك من يترقب أداء ناريا هائلا للروس والسوريين في هذه المرحلة لجعل جبهة النصرة أثرا بعد عين حيث تستهدف .. وغياب النصرة سيفتح المجال أمام الحل السياسي لأن كتلة القوى الراديكالية ستضعف وستقبل بالحل السياسي دون تشنج لأن النصرة هي التي تقود عملية العناد والرفض معتمدة على تنسيق وتفويض سري له صفة الأوامر من تركيا والسعودية بالرفض..
1- أما ان تهاجر موجات المقاتلين من النصرة الى تلك الفصائل التي نأت بنفسها عنها تجنبا للابادة أو كنوع من التقية وتغيير الألوان مؤقتا تلبية لتوجيهات القيادة التركية التي ستفرغ جبهة النصرة من مقاتلبها وتجعلهم منتمين لأسماء أخرى بنقل ولاء مقاتليها ظاهريا الى فصائل معتدلة حتى تتغير الوقائع السياسية والميدانية .. وهذه خدعة محتملة من قبل الأتراك للحفاظ على النصرة بلباس جديد ..ولكن الخطر في هذا أن ذوبان النصرة في التنظيمات الأخرى “المعتدلة” سيجعل التنظيمات المضيفة تخوض بسرعة صراعا عقائديا مع الوافدين الذين سيحسون أنهم فقدوا القيادة وصاروا من الأتباع .. لأن الأمر هنا ليس مهاجرين وأنصارا بل صراع الخليفة مع الطامعين بالخلافة ..وهو مشروع تدمير ذاتي للطرفين ..
2- أو أن الهجرة بين المقاتلين ستكون معاكسة أي من الفصائل “المعتدلة” نحو النصرة كرد فعل على خيانة الداعمين للمعارضة لجبهة النصرة التي آزرتهم ومكنت حكم الله وصارت أكثر شرعية جهادية من الفصائل التي ستتهم أنها خانت الجهاد وانخرطت في كفر العمل السياسي الدنيوي والزندقة ..
اذا خرجت الآن داعش والنصرة هما عماد القوة المحاربة ويشكلان ثلثيها تقريبا حيث منح الجيشان السوري والروسي تفويضا مطلقا بالقضاء عليهما .. فان هذا يعني أن بقية الفصائل المحاربة التي تقبل الهدنة – ومنها جيش الاسلام – ستكون وحيدة بعد فترة أمام قوة الجيش التي ستتفرغ له كليا بعد تحطيم القوة الضاربة لداعش والنصرة .. ويكون أمامه اما خيار التسوية أو معركة ضارية جدا لايقدر على الصمود فيها ..لأن كل جيش الاسلام لايساوي شيئا أمام أعصار الجيش الذي سيتكفل بابادته اذا انفرط عقد داعش والنصرة اللتين تشتتان جهد الجيش السوري وتمتصان ثلثي قوته شمالا وشرقا وتبعدانه عن الفتك بجيش الاسلام مما أطال عمره في دوما الى هذا اليوم ..
لذلك تبدو فائدة الهدنة للسوريين والروس كبيرة لأنها تعني باختصار تهئية الساحة لافراغها من القوى المسلحة القوية المعاندة .. وغياب القدرة على اللعب بالميدان سيليّن المواقف السياسية ويذيب الرؤوس الحامية المتشددة .. ويجعلها تميل لحلول سياسية منطقية عادلة في اطار حوار سوري سوري دون سيمفونيات عادل الجبير وصنجات رياض حجاب .. ماتفعله سورية وحلفاؤها ليس خدعة في الهدنة بل البحث عن تفاوض سياسي أو تهئية ظروفه من دون بقاء أسباب العناد والتشنج والمكابرة السعودية التركية ..أي بعد تجريدهما من القوة الارهابية تحت سقف محاربة الارهاب الدولية ..
الأتراك سيتنبهون الى المعضلة والمشكلة العويصة والتحدي في قبول الهدنة .. واذا قبلوا فانهم سيحاولون اللعب تحت الطاولة اما لاستثمار الهدنة لتعويض النقص في مقومات الصمود لدى المسلحين أو لتخريبها عندما يتبين أنها أكثر ضررا وقتلا من الحرب .. وخيار المناورة وكسب الوقت من قبل تركيا لسد ثغرات الصمود صعب التطبيق للغاية طالما بقي الطيران الروسي وأعمال الرصد والتنصت قائمة بفعالية وهي نشاطات غير مشمولة بالهدنة .. كما أن فقدان ورقة جبهة النصرة عبر تواصل ضربها سيجعل امداد تركيا للجسم المسلح غير ذي جدوى .. واذا تم تخريب الهدنة فان يعني أن الطرف السوري الروسي لن يلام في استخدام المزيد من القوة النارية الطاغية لاقتلاع المسلحين والاستيلاء على اورق تفاوض عزيزة على تركيا والسعودية ..
في الهدن اذن لاتبحثوا عن شمشون بل ابحثوا عن دليلة التي خدعت شمشون وقصت له شعره في “هدنة” .. وانتهى وقد أحرق الفلسطينيون عينيه وشغلوه في طحن الشعير ..
بعد الهدنة بفترة وجيزة ستأتينا الأخبار وسنرى من الذي لعب دور دليلة .. روسيا أم أميريكا؟؟ ومن الذي كان شمشون.. أبو محمد الجولاني أم محمد علوش؟؟ .. أم سلمان …. أم …. أردوغان؟؟ .. وقد قصت دليلة شعره أثناء الهدنة .. وربما شيئا آخر عزيزا عليه .. سلبه رجولته وفحولته .. وسيصير بعده “ثمثون الطيب” ..
لأجل حماية الحراك من الشبيحة! Leader of Yemeni revolutionaries, Ansarullah, Sayyed Abdul-Malik al-Houthi asserted that the movement supports reaching a political solution in the country, considering that Riyadh Conference would fuel the conflict in Yemen. Sayyed Houthi said that the Saudi regime has been exposed by its aggression on Yemen through committing the crimes of targeting the civilians and all the life necessities. The Houthi leader stressed that the popular committees and the Yemeni army will keep fighting the terrorists courageously despite the Saudi intensive air raids. “Who is betting on the Saudi aggression will lose,” Sayyed Houthi said. The Yemenis are sacrificing all what they possess to face the brutal aggression which employed internationally prohibited weapons, according to Sayyed Houthi. Yemen has been since March 26 under brutal aggression by Saudi-US coalition. Thousands have been martyred and injured in the attack, with the vast majority of them are civilians. The war on Gaza is now in its 49th day. The Resistance continues to fire rockets at the same rate as the first day of the conflict. Al-Akhbar, not without difficulty, was able to meet Abu Tariq, a field commander in the Nasser Salahuddin Brigades, the military arm of the Popular Resistance Committees. The Nasser Salahuddin Brigades consist of approximately 3,000 fighters, and are the military wing of the Popular Resistance Committees. The Brigades were formed in 2001 with the beginning of the second intifada, known as the al-Aqsa Intifada, and participated in many operations, most notably the bombing of the first Merkava tank, as well as the capture of Israeli soldier Gilad Shalit in 2006. Its fighters have proven themselves in recent battles. The following interview started before the most recent truce, and continued after the resumption of hostilities. Al-Akhbar: The truce between the Palestinian Resistance and Israel has collapsed, and the war has now reignited. Were you in favor of granting the enemy repeated truces? Abu Tariq: We in the Nasser Salahuddin Brigades, we were against granting the enemy a truce because we feared the enemy would take advantage to reactivate its agents, and gather intelligence on the whereabouts of Resistance fighters, leaders and rocket storage facilities. We said that the Israeli occupation would use this truce to update its intelligence, which may put us at risk. The assassination attempt against the general commander of al-Qassam Brigades, Mohammed al-Deif, proved the validity of this concern, but for the sake of the unity of the Palestinian ranks, we eventually agreed to it. Al-Akhbar: For your side, how did you take advantage of the truce with the enemy? AT: We ensured that [the location of] rocket storage facilities and platforms remained unknown to collaborators; we do not just have to deal with local spies and agents, but also with regional powers that collaborate with the enemy against us. This is in addition to field work, where we sought to preserve the morale of Resistance fighters, especially with the repeated ceasefires that could have weakened their morale. As is known, we depend primarily in our fight with the enemy on the resilience of our fighters, and for this reason, we would rotate the duty shifts of the Resistance fighters so that they could check on their families and relatives. Al-Akhbar:There are reports about the possibility of a ground operation against Gaza. Are you prepared for this contingency, even after 49 days of fighting? AT: We do not believe that the Israeli army is prepared to fight a ground battle in these circumstances. The outbreak of war in July, a hot month, has handicapped the fair-skinned [Israeli] soldiers. The images published by international agencies show just how comfortable their crowds on the border are. Furthermore, the enemy’s lack of intelligence regarding the Resistance’s capabilities has denied enemy soldiers the ability to operate freely on the field, because we and the Resistance factions work in utmost secrecy, and work hard for the enemy not to known the nature of our locations and the ambushes that have been prepared. During the last round of ground combat, the soldiers opted to stay inside tanks for fear of sniper fire or capture. So it seems that the enemy sought a truce to exploit the time factor, and perhaps even wait for temperatures to go down. But if they return, then this, simply, is better for us than having to go to them. The operations we carried out behind the Green Line cost us tens of thousands of dollars just to reach a tank and attack it, starting with preparation, digging tunnels, and working secretly. With these operations, our best hope was to hit a soldier; so obviously, it is easier if tanks and soldiers came to us instead. In addition, a decision has been made regarding the need to kidnap soldiers. During the battle, we work hard to “sort” the soldiers, that is, classify them and set apart the Druze, Bedouin, and Lahdis [members of the collaborationist South Lebanon Army] embedded in the Israeli army, because the goal is to capture “100-percent Israeli” soldiers, so that we can swap them with our prisoners and guarantee the success of exchanges later. Al-Akhbar: Are you represented in the joint operations room with the rest of the factions? AT: There is coordination with all Palestinian factions. We have representatives in the joint operations room whenever it is operationalized, and we are apprised of any field or military developments. Al-Akhbar: What range have the rockets you fired into occupied cities reached? For how long can you continue to fire rockets? AT: The enemy does not know the quantity of rockets we have and which ranges they can reach. In the early days of the war, we bombed the settlements close to Gaza, and the range of the rockets reached 20 to 40 km. After 20 days of the aggression and as the battle on the field evolved, we launched rockets that reached 65 km. With the continuation of the war, the enemy will be surprised with longer ranges and fiercer ground operations. As for the stockpile, we have used less than 10 percent of what we have. With every rocket we launch, there will be one to replace it, because our manufacturing unit has not stopped producing rockets whether during the truce or under bombardment. Al-Akhbar: How do you bring in raw materials to manufacture these rockets? AT: The leaders of the Brigades are adamant about continuing to make and develop rockets despite the blockade, and although we know there are agents watching what we do. The development unit in the Brigades is resolved that no matter the cost in blood or treasure to develop our rocket capabilities, we will not stop. In addition to locally manufactured rockets, we use tunnels to bring in weapons and raw materials for manufacturing. Al-Akhbar: Is there contact between you and Hezbollah? AT: We feel great gratitude and appreciation for our brothers in Hezbollah, who do not withhold anything from us in the Brigade. They enrolled men and fighters from the Brigade in several military sessions for training with Hezbollah in Lebanon. Our fighters learned new combat skills, and gained a broader knowledge of the type of rocketry, their manufacturing techniques, how to specify coordinates, down to camouflage and planting bombs. We have now excellent knowledge on “cooking explosives” of all kinds. After the members returned to Gaza, carrying military know-how and ideas from Hezbollah, we used these techniques on the battlefield. They have proven their worth in the current war. We have also met with members of Hezbollah who trained our men on making and firing rockets, both inside and outside Gaza. Al-Akhbar: How do you perceive your cooperation with Hezbollah and the statement its secretary general, Sayyed Hassan Nasrallah, made during the war, saying that Hezbollah will support the Resistance in Gaza? AT: We at the Nasser Salahuddin Brigades are not surprised by the generosity of the brothers in Hezbollah, led by the honorable Sheikh Hassan Nasrallah. We are not surprised by their continued support for our organization, which has not stopped for even a moment. We pin great hopes on our brothers in Hezbollah, who never let us down, not even for a minute. As is known, the speeches of the honorable Sayyed Hassan Nasrallah are sincere, and he does not speak words in vain. After his recent speech about supporting the Resistance, the enemy moved some soldiers from the south to the north of the entity [i.e. Israel], fearing a military intervention from Hezbollah in the final minutes. We, from Gaza’s borders, monitored the movement of Israeli vehicles, and had information that the enemy had moved some forces to the north as had happened in 2006. Finally, as is known, Hezbollah provides logistical, material, and moral support to the Resistance factions, and many know that this support has not stopped. The indirect talks between the Palestinian and the Israeli negotiators in Cairo are to be resumed today to conclude an agreement on a long-term truce in the light of an Egyptian suggestion in this regard. Egypt suggested implementing a permanent ceasefire in Gaza and resuming the negotiations in a month. Zionist Prime Minister Benjamin Netanyahu said ‘Israel’ would not agree to any proposal which did not offer a clear answer to the entity’s security needs. For their part, Hamas and Islamic Jihad movements announced that they are ready for all the possibilities and that the Zionist government has to accept the Palestinian conditions in order to reach a final agreement. The Palestinians in Gaza and the West Bank expressed their solidarity with their delegation to Cairo and asserted that they prefer war to a degrading agreement. The Palestinians also accused the Israeli government of resorting to deception in order to shun implementing any agreement’s provisions which meet the humanitarian needs of the Palestinian people.